ACtipur Tinted corrects and mask imperfections in a single gesture. With patented complex Phytosphingosin, Ceramides and Vitamin PP promoting debugging and regulating sebum secretion, skin is matte, imperfections forgotten. Its color specifically designed for darker skin and makeup can hide without a trace. 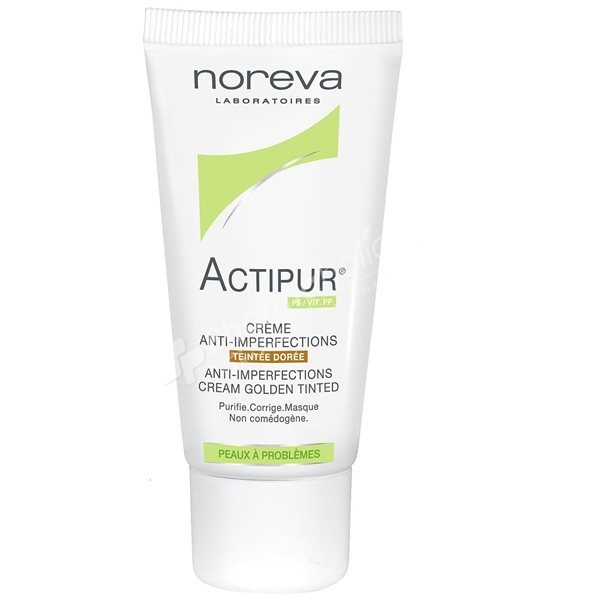 Noreva Actipur Anti-Imperfections Cream Tinted corrects and hides the imperfections of problem skin. It enhances the imperfections removal and regulates the sebum production thanks to the patented complex composed of: Phyrospingosine, ceramids and Vitamin PP. Apply on the concerned areas before sun exposure. Renew the application every 2 hours. Aqua, Cyclopentasiloxane, CI 77891 (Titanium Dioxide), Propanediol, Disterardimonium, Hectorite, Methyl Methacrylate Crosspolymer, Cetyl Peg/Ppg-10/1 Dimethicone, CI 77492(Iron Oxides), Bis-Peg-PPG-14/14 Dimethicone, Dimethicone, Magnesium Sulfate, Niacinamide, Tocopheryl Acetate, Caprylyl Glycol, Sodium Benzoate, CI 77499 (Iron Oxides), Potassium Sorbate, CI 77499 (Iron Oxides), Chlorphenesin, Parfum, Sodium Lauroyl Lactylate, Disodium Edta, Caprylhydroxamic Acid, Glycerin, Xanthan Gum, Dimethiconol, Disodium Stearoyl Glutamate, Ceramide NP, Phenoxyethanol, Aluminium, Hydroxide, Limonene, Ceramide AP, Phytosphingosine, Linalool, Cholesterol, Hydroxycitronellal, Carbomer, Diethyl Phtalate, Citral, Cyclotetrasiloxane, Ethylhexylglycerin, Benzyl Salicylate, Alpha-Isomethyl Ionone, Hexyl Cinnamal, Citronellol, Pentaerythrityl Tetra Di-T-Butyl Hydroxyhydrocinnamate, Bht, Benzoic Acid, Ceramide EOP, Tocopherol.